I don't know if you know this, but superheroes are Kind of A Big Deal. Every other week it feels like a new Marvel movie is coming out and the hype train for each release is undeniable. Just look at how the upcoming Avengers: Endgame broke sales records and sales sites at the same time within hours of tickets going on sale earlier this week. I’m not here to talk movies though. That’s not what this site is about. Alongside releases in the Marvel Cinematic Universe (or MCU, if you're so inclined) are a plethora of the media tie-ins, not the least of which are mobile games, and I’m writing this to tell you that yes, indeed, there’s a fantastic superhero game that trumps all others, and you should all be playing it if you want your superhero fix. The only thing is, it's probably not a game you'd suspect. There may be some decent Marvel mobile games out there. Heck, some might even be considered “good.” That said, the absolute best superhero game on iOS actually has no affiliation with Marvel, DC, or any other actual comic book publisher. Do you know where I'm going with this? 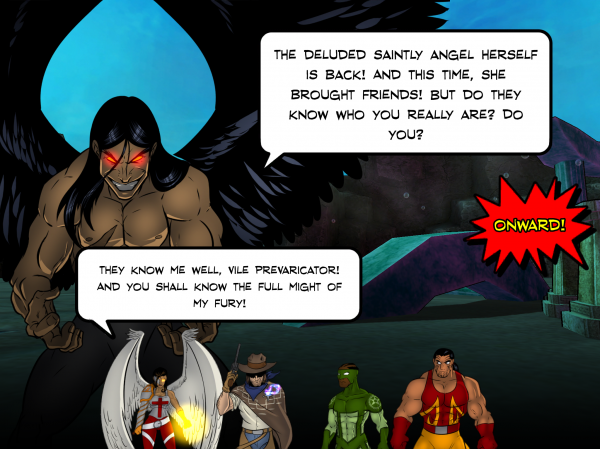 The best superhero game you can get on the App Store today is Sentinels of the Multiverse. This game is a digital adaptation of a co-op board game where players work together using comic book-like heroes to take down evil villains. Although it doesn't sport recognizable figures like Captain America or Spider-Man, it more than makes up for that in a few key ways. See below for my reasoning why Sentinels of the Multiverse is the absolute best comic book superhero game on mobile. The first and–most critically–important thing about Sentinels of the Multiverse is just how dedicated the game is to feeling like a true face-off between heroes in villains. Every match of Sentinels of the Multiverse pits teams of 3-5 superheroes against ultra power evil-doers as they square off appropriately comic book-like locales. Although the game itself is essentially a card-based combat game, the way these fights play out always feels like a knock-down, drag-out struggle, complete with feelings of impending doom, heroic triumph, and everything in between. It also helps that Sentinels of the Multiverse presents all of its action using menus and play fields that look and feel like you're playing through comic book panels. Another reason why Sentinels of the Multiverse is the best superhero game out there is its sheer breadth of content. If you buy Sentinels of the Multiverse at its base price of $1.99, you get access to 10 heroes, 4 villians, and 4 environments, but there's potential for you to get more than four times that amount of stuff if you invest in its season passes. As of this writing Sentinels of the Multiverse actually just finished adding the last bit of additional content to the game, and the purchase of two season passes (at $24.99 each), you gain access to 35 heroes, 20 villains, 21 environments, and two new games modes. It's a bit of an investment, sure, but you don't have to buy unless you're sure you're all in on the game. It's a perfectly fun game to play while mixing and matching the base villains, heroes, and locations. That said, having both season passes does truly make it feel like you have access to an entire comic book universe at your fingertips. All of these heroes are original, non-licensed characters who add interesting dimensions to Sentinels of the Multiverse's combat mechanics. Plus, there are more than enough characters that act as stand-ins for existing Marvel or DC favorites so you can (sort of) re-create classic fights if you so choose. Outside of a couple LEGO licensed games, Sentinels of the Multiverse is one of the only paid, premium superhero games on the App Store. This means that–while you may have to pay for the game upfront–you'll never have to contend with ads, premium currencies, or any other nightmareish monetization schemes that it seems every free mobile game is packed with these days. Sentinels of the Multiverse does have in-app purchases through its store (as mentioned above), but even that doesn't feel overly intrusive. There's no active pushes by the game to make you buy anything. It's only there if you want more Sentinels of the Multiverse to play, which is how it should be. The true beauty of Sentinels of the Multiverse is just how replayable it is. Every time you pick it up, you can choose a new combination of villains, heroes, and environments, and you'd have to play an absurd number of matches before things started feeling same-y. Since each villain, hero, and environment has their own unique deck of cards associated with them, every match lets you see new and interesting interactions between powers, equipment, hazards, and attacks. You don't always have to come up with them on your own, either. Sentinels of the Multiverse also has options for multiplayer and a “Weekly One-Shot” Mode that lets you test your skills in pre-made challenge scenarios. This is all to say that no matter how many times you've played Sentinels of the Multiverse there's almost always something new to discover.